Two of the top email marketing software providers are MailChimp and Constant Contact. While they offer many of the same services, the quality of the services, customer support and price varies. Depending on what you want from your email marketing software, you may want to choose Constant Contact or MailChimp as your provider. As a small business marketer, you have to carefully use the funds that you have. While the services and quality of software matters, price is still a key issue. Determining your budget will help you decide which provider to use. If you are a small business, the free package offered by MailChimp is the best one to choose. While it offers decent scalability, packages can become expensive as your business grows. Due to this, the price question is not as easy to answer as it may first appear to be. When you sign up for Constant Contact, you receive a 600-day trial period for free. During the first 60 days, you can email up to 100 contacts an unlimited number of times. When your free trial ends, email marketing at Constant Contact starts at $20 per month for 500 contacts or less. At the maximum level, you can email 10,000 contacts for $85 a month. Recently, Constant Contact created a new plan that includes more than just email. Known as the Email Plus Plan, this offering allows you to do emails, surveys, coupons, registration forms and more. For 500 contacts, this plan starts at $45 a month. If you have up to 10,000 contacts, the Email Plus Plan costs $110 per month. Constant Contact gives a 10 percent discount to any company that pays for six months in advance. If you want a 15 percent discount, you have to pay for a year in advance. Meanwhile, nonprofit organizations receive a 20 percent discount for paying six months in advance and 30 percent off for a year in advance. At MailChimp, you can get a Forever Free package. This version allows you to send out up to 12,000 emails every month to 2,000 subscribers. Paid email marketing starts at $10 a month for unlimited emails. This package works for up to 500 subscribers. For each 500 subscribers that you add, the monthly package increases by $5 each month. Another option available is the Pay-As-You-Go package. This package lets you purchase credits for $0.005 to $0.03 cents per email. While this does not work well for large subscriber lists, it is ideal if you need to scale up quickly or have slow seasons. This package is also ideal if you have a one-time campaign to a large list of new subscribers. If you are sending a high volume of emails, you may want to use the CPM pricing option. You can purchase email credits for $1.25 per thousand emails. In large amounts, this rate drops to $0.40 per thousand. In addition, MailChimp gives nonprofit organization a 15 percent discount on all packages. Since MailChimp offers the Forever Free model, it is the clear winner when it comes to prices. Small businesses can send out up to 2,000 emails per month without having to pay anything. Since Constant Contact has unlimited emails with their packages, you may want to choose Constant Contact if you have thousands of subscribers and send out emails multiple times a month. Both tools offer an exceptional number of features, so it is impossible to include all of them. These email marketing providers are continuously updating their technology and tools for the best level of functionality. To easily compare these services, we have looked at the basic functionality and features. MailChimp offers some features that Constant Contact does not offer for larger companies. It also offers better scalability. Constant Contact has a more intuitive design that makes it easier for newcomers to email marketing. 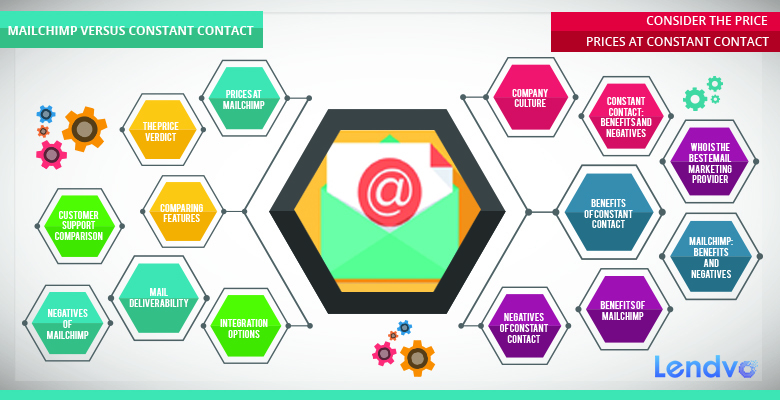 Plus, Constant Contact has professional-looking templates that are ideal for business emails. Due to these features, Constant Contact and MailChimp are tied in terms of functionality. Luckily, you will rarely have to use customer support with either company. MailChimp and Constant Contact are intuitive and simple to use. Even if you are unfamiliar with modern technology, it is easy to master both programs. If you do have to call customer support, MailChimp only lets free accounts use the Knowledge Base. New users do receive 30 days of free support initially. Afterward, customer support is primarily available to paying customers. For paying customers, email and chat support is available at every time of the day during the week. On weekends, customer support is limited to email services. With Constant Contact, phone, email and chat support is available during the work week at any time. On the weekend, it has email support. All of these options are available for users in Canada and the United States. In the United Kingdom, Constant Contact offers limited phone support. Constant Contact also offers community forums, email marketing boot camp classes, local seminars and video tutorials for new users. If you need extra help, Constant Contact sells extra support services and training. These include options to set up your account, design custom templates or hire a personal marketer. While both companies, users get similar access to customer support during the week and weekends. The main difference is in the paid support options and training features provided by Constant Contact. Due to the forums, resources and training options, Constant Contact is the clear winner in terms of customer support. Compared to the rest of the industry, Constant Contact and MailChimp offer exceptional deliverability. According to Shero Designs, MailChimp has a 96 to 99 percent deliverability. Meanwhile, Constant Contact has a 97 percent deliverability. MailChimp is strict about spam, so it will prevent messages from being delivered if they appear to be spam. At the same time, MailChimp also allows you to upload subscribers who have unsubscribed to your list. If you do the same action in Constant Contact, it can occasionally cause your entire account to be blocked. In terms of interface, MailChimp has an intuitive interface that is easy to use. The design is more modern, and there are numerous template options available. You can use pre-designed templates for basic messages. There is also a blank template option if you need a more tailored option. To create a blank template, you just have to use MailChimp’s drag-and-drop builder. Constant Contact has a more difficult interface to use, but it is still fairly easy to navigate. You can adjust the template’s color or text until you get the right look. While you can still customize the template, there are fewer options available. With Constant Contact, the mail deliverability is consistent. Unlike MailChimp, messages are rarely marked incorrectly as spam. Some users of MailChimp have reported that their messages end up in clients’ spam folders, so Constant Contact is a safer option. Both MailChimp and Constant Contact have numerous integration options. You can integrate them with social media, blogging platforms and CRM software. MailChimp can easily be integrated with Drupal, WordPress, Eventbrite, Magento, Google Analytics, Twitter, ZenDesk, BigCommerce, Mandrill and Salesforce. Meanwhile, Constant Contact is better at integrating with ACT!, WordPress, Highrise, Hootsuite, MINDBODY, Sugar, Zoho, Outlook, Quickbooks and Facebook. Constant Contact has a platform that includes its own functionality for events, social media marketing and surveys. Due to this, they have fewer integration options available. Overall, MailChimp is the easy winner when it comes to social media and third-party integration. While company culture is the last thing to worry about, this factor still determines the quality of services and customer support at each email marketing provider. MailChimp deliberately encourages a friendly, playful and fun company culture. Due to this, they offer guides, coloring books and promotions that fit in with their company culture. At Constant Contact, the company culture revolves around respect and helpful services. They focus heavily on mass media, television and radio advertising. Due to this, Constant Contact enjoys a wider brand recognition. Their customer support is designed with online resources, blogs and learning centers that help each customer create the right campaigns. When it comes to culture, the winner depends on whether you want a fun company or a trustworthy one. With over 20 years of experience, Constant Contact has had years to work out any glitches or problems with their services. For newcomers, this company offers a number of benefits. This company offers 24/7 customer support. Email support is the only option available on weekends. The template is easy to use and offers customization options. Constant Contact has a mobile app, so you can stay in touch from anywhere. This company is more expensive than MailChimp and does not offer a free plan. Constant Contact does not include an RSS-to-email feature. You can still include blog content, but it will not be done automatically. Constant Contact does not let you do A/B testing easily. You can try to do A/B testing, but it will be frustrating. MailChimp is a fun, friendly interface that is simple to use. They have less experience than Constant Contact, but they are quickly starting to catch up. Like Constant Contact, the desirability of MailChimp really depends on what you want it for. If you want to just test the waters with a small campaign, the free option makes MailChimp an ideal service to use. MailChimp offers an impressive number of reports, so you can easily test out each email plan. A/B testing is easy to do with MailChimp. This company offers entirely free emails for the first 2,000 subscribers and 12,000 emails each month. MailChimp offers an impressive number of apps that you can use from your mobile device or computer. These apps include MailChimp VIPs, MailChimp Coupon Scanner, MailChimp Mobile, MailChimp Editor, Mobile Signup Forms, MailChimp Snap and SMS for Events. The MailChimp Mobile App lets you send, develop and track campaigns from your phone. MailChimp Snap lets you take a photo and turn it into an email campaign. The free account may be cheap, but it does not include all of the normal features offered in MailChimp’s paid services. If you want to send automated emails, you have to upgrade from the basic package. While the paid packages start at $10 per month, these only cover 500 subscribers. Due to this, MailChimp can quickly become expensive. MailChimp does not like affiliate marketing, so it will stop any email message that includes one of the blacklisted links. Customer support is not available with the free plan. Your account can be shut down if it looks like spam or includes affiliate marketing. Who Is the Best Email Marketing Provider? Constant Contact has better support and a proven track record in the industry. While it would initially seem like this email marketing provider is the winner, the price of each service matters. If you are looking for a small batch of emails to minimal subscribers, the free plan at MailChimp is by far the best option to choose. MailChimp provides a number of impressive apps and functional email marketing services. Best of all, it offers these services for free for smaller email lists. While MailChimp is the clear winner in terms of price, it may not always be the best option for your company. If you have a larger email list, MailChimp can quickly become too expensive. Constant Contact has more high-end features and customer support. Unlike MailChimp, Constant Contact lets you immediately pick up the phone and call customer support. Unfortunately, Constant Contact lacks the RSS-to-email and A/B testing options that MailChimp has. As a result, MailChimp is the overall winner. Depending on your company’s needs, Constant Contact may still be the best option. Consider the types of services, costs and support your business needs before deciding on your email marketing provider.